If you couldn’t tell already, we have a passion for retro games here at Cinopt Studios. All 3 of us collect old games and like to play them regularly. We play most, if not all the new games coming out on our PS3s or our custom build PCs. While we love new gameplay and beautiful 3D graphics, we have a special fondness for the graphical styles of games we grew up playing. Our love for these games can be seen in the mobile games we have made, as well as the starter kits that we have released for Unity. We know there are plenty of people looking into game development who have the same passion for these aesthetics as we do. Unity is a great program for developing 3D games, but we hope that our starter kits can show that Unity can be used to make great 2D games as well. 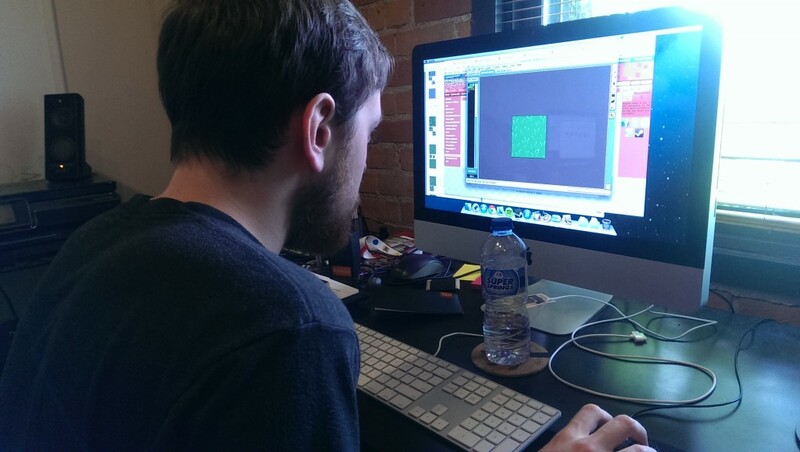 Pictured above is Brent working on a grass texture for our next starter kit. Brent does most of the art and texture work here at Cinopt Studios. Recently we’ve been using a program called Aseprite, this is a completely free program that works great if you are going for a 8 or 16bit feel. We have used this program for all of our 2D starter kits so far. If you download it and like it, consider donating to them!